Hello everyone! I have to say I am excited to share this post with all of you. With a New Year comes new beginnings and new opportunities--and CHA with lots of new products. 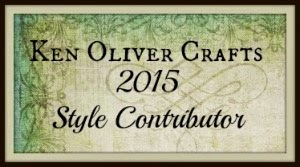 So I have a CHA Sneak Peek from Ken Oliver Crafts to share with you. 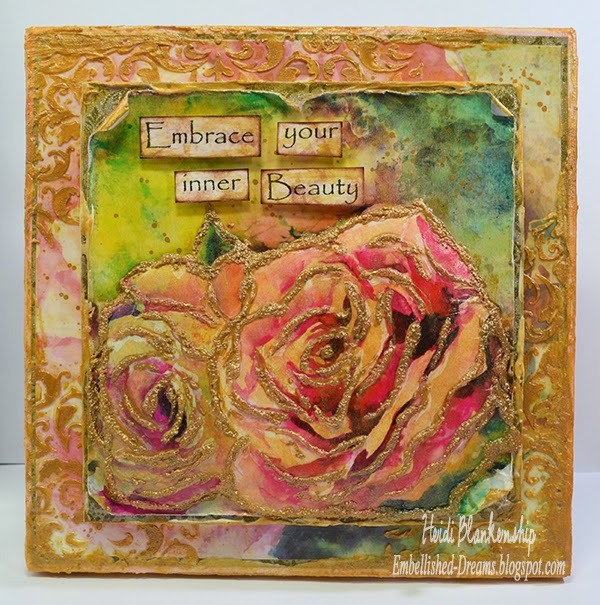 This is a 8 x 8 canvas that I designed using papers from Ken Oliver Crafts Watercolor Memories Collection. 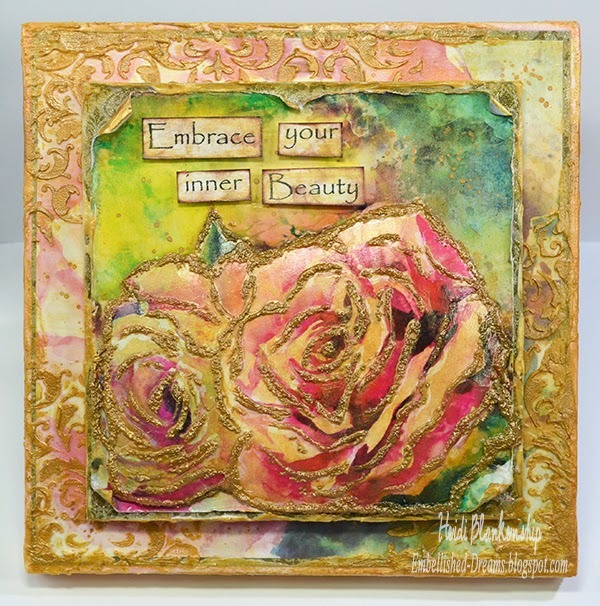 This canvas will be at CHA with all of the other beautiful projects created by some amazing designers. This is such a beautiful watercolor floral collections. One of the things I really love is that one side of the paper has soft muted colors and the other side is bright and bold. For the canvas I used the 12 x 12 and 6 x 6 Watercolor Rose paper. For the background of the canvas I used 12 x 12 paper with the softer colors and for the focal point I used the 6 x 6 paper with the brighter colors. 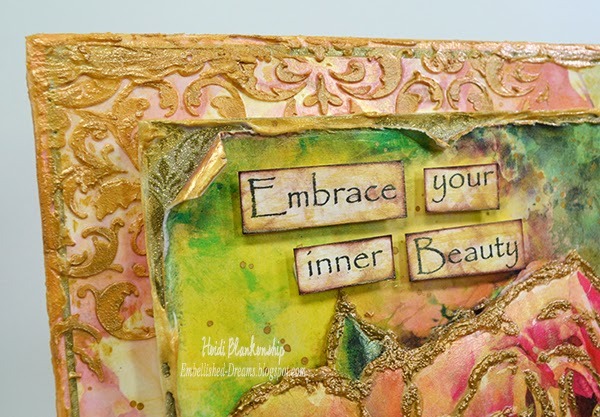 I also used a Prima stencil and applied Liquitex Modeling Paste to create the flourishes. 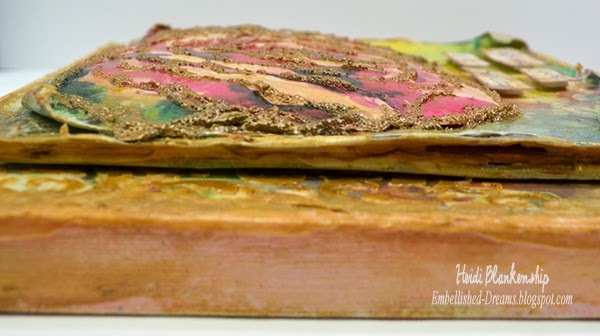 Then I used Ranger Tim Holtz Distress Spray Stains-Spun Sugar and Tarnished Brass to highlight the textured areas. Here is a side view so you can see some of the dimension. For the focal point in the canter I used some fun foam to pop up the center part. Then I used a whole sheet of the 6 x 6 size paper and applied that to the fun foam and used more of the modeling past to cover up the foam. Then I used a second 6 x 6 piece and fussy cut the roses. I used a stylus to make the paper more pliable and shape it. Then I more foam to the back to also pop up the image. 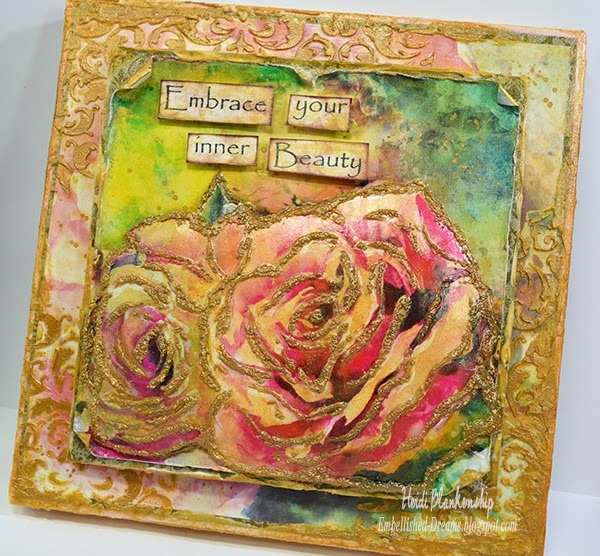 I applied Golden Glass Bead Gel to the image of the roses. 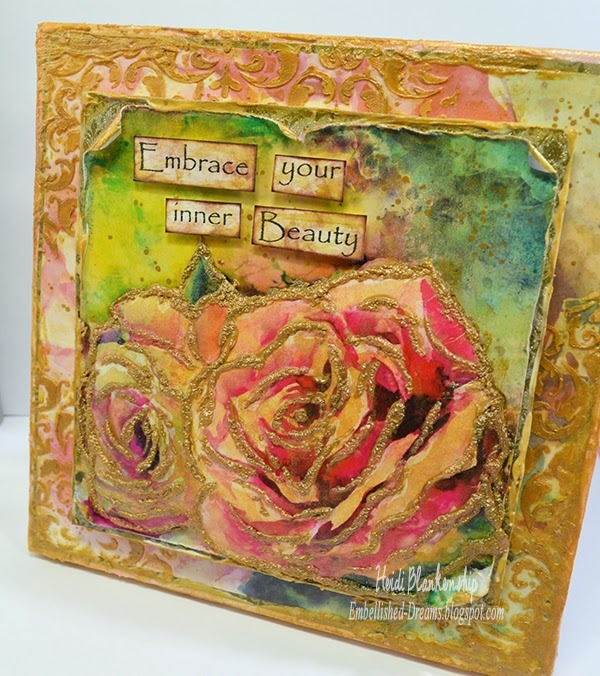 Doing this adds more texture and dimension to the roses. The Glass Bead Gel is white but as it dries it becomes clear and it is filled with clear micro beads. You can leave it as is or add color to it. I used a paint brush and added Tarnished Brass Distress Spray Stain on the Glass bead Gel once it was dry. I printed out the sentiment with the computer and cut them in to word blocks. I used another fantastic new product from Ken and that is his new inks. I used the Walnut ink on the word blocks. Now I know this isn't the prettiest picture but I just wanted you to see the dimension. I had so much fun just playing and creating this canvas! Ok, I guess that's it for today. Don't forget you can click on all of the pictures to enlarge them and see all the details. Thanks so much for stopping by today and I hope your New Year is off to a great start! congratulations on your newest venture as a style contributor for ken. such amazing work from you all. i'm looking forward to new ideas and products. this canvas is ...(i'm tiring of the same over-used adjectives: ...awesome,beautiful, etc. )this canvas is supercalifragilisticexpialadosous!! I would like to try some canvas art! Yours came out so pretty. 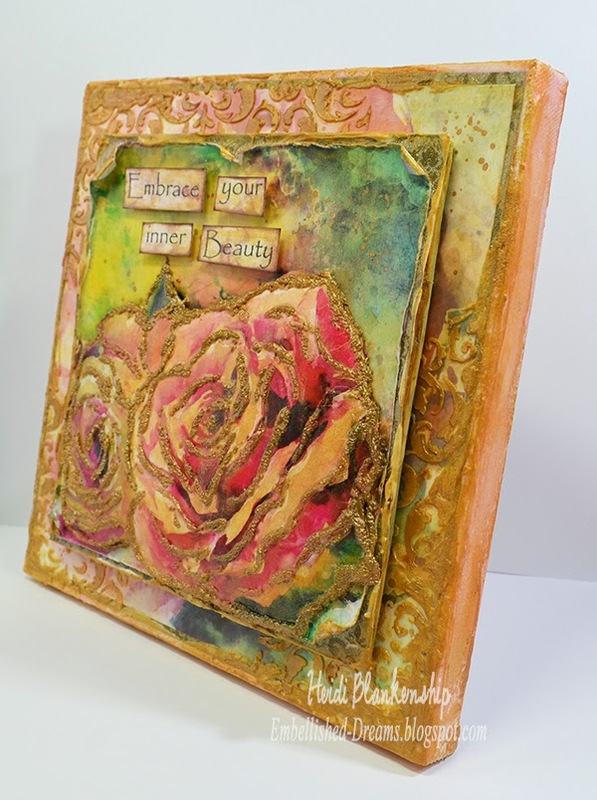 wow Heidi, this is gorgeous! Such beautiful colors. Big congrats hun with this new venture here. Your canvas is absolut stunning and sooo well made in every detail. Amazing work, well done. Oh my this canvas is a true work of art , i just love it ! What a great project! Thanks for sharing. The paper is so beautiful.